﻿ Four Points by Sheraton Los Angeles International Airport, Los Angeles (CA) | FROM $107 - SAVE ON AGODA! 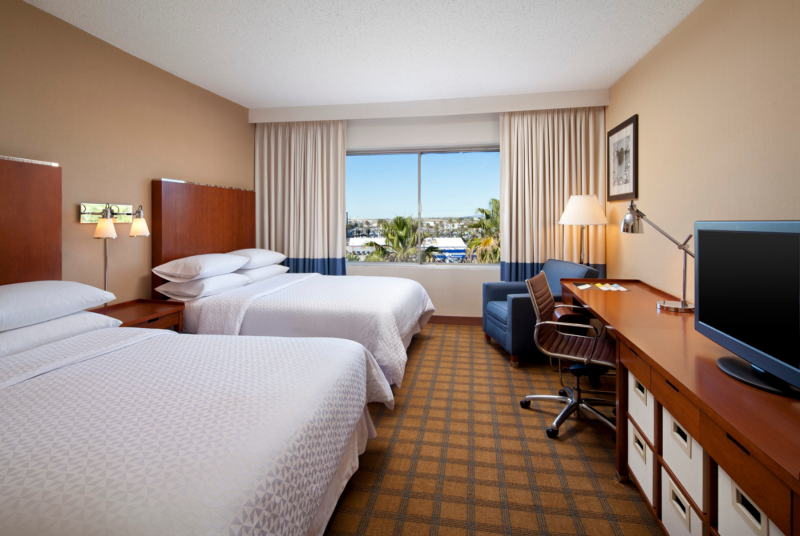 Have a question for Four Points by Sheraton Los Angeles International Airport? "Furiated customers upon checking however I felt staff was excellent in expediting everyone to their rooms." 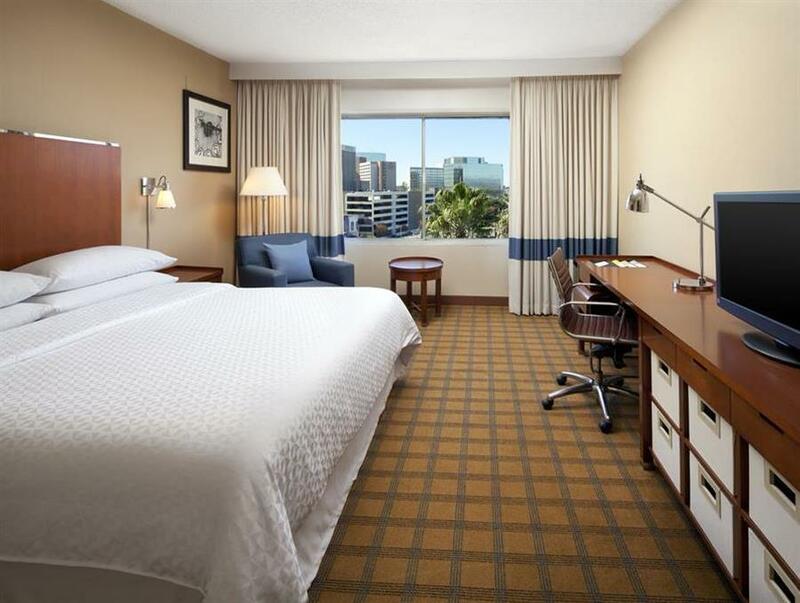 "Best place near the airport"
"Nice place, cosy and worth of money"
From a weekend away to an extended vacation, reserve a room at the Four Points by Sheraton Los Angeles International Airport for an eventful experience. Well-positioned in the center of Los Angeles, the hotel is the perfect place to stay to explore the area. It is close to University West Los Angeles, Otis College of Art and Design Gallery, City University Los Angeles, Hillside Memorial Park, and Hollywood Park. The Four Points by Sheraton Los Angeles International Airport has a bar, restaurants on the property, vending machines, a coffee shop, and room service, so there is a selection of dining and snacking options. It has several convenient features, such as safety deposit boxes, a currency exchange, a laundromat, as well as a variety of shops. This hotel offers various facilities for guests to enjoy, such as a golf course, a fitness center, an outdoor swimming pool, a spa, and ticket services. It features family rooms, so your entire family will have adequate space to hang out together. Offering guided tours, the Four Points by Sheraton Los Angeles International Airport is a great spot to stay to learn about your surroundings and see everything you can while you're here. 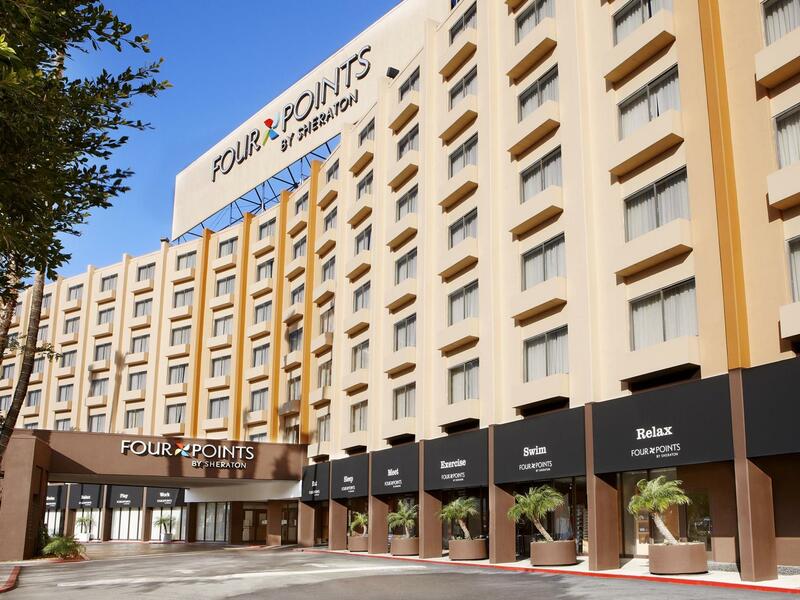 The Four Points by Sheraton Los Angeles International Airport provides a range of useful services, which include dry cleaning services, luggage storage, a concierge, as well as daily housekeeping. 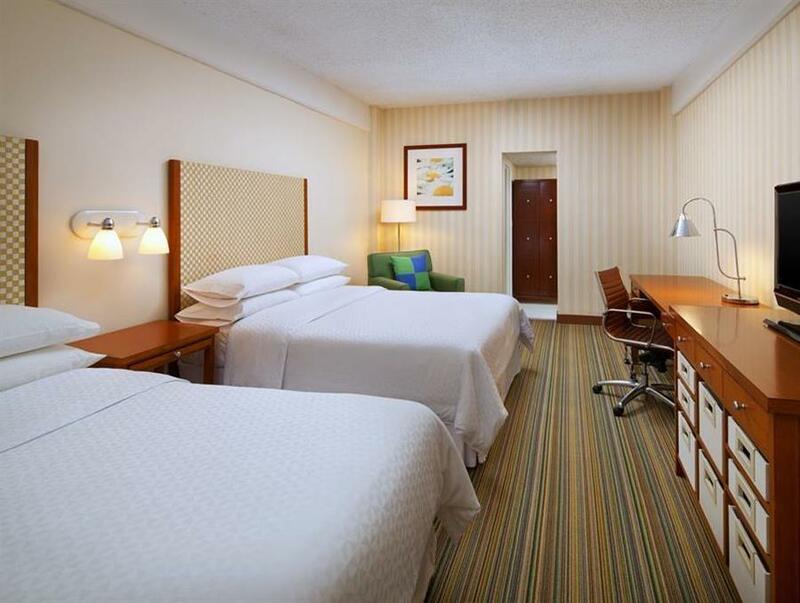 All of the rooms have air conditioning, a closet, carpeting, and a desk. There's free Wi-Fi in all rooms, as well as Wi-Fi in common areas, allowing you to access the network without overspending on roaming and data costs. With pet-friendly facilities, this hotel is ideal for travelers who can't bear to be away from their pets. With a front desk that's open at all hours, it ensures that there is always someone on call to answer any questions whenever you need. The Four Points by Sheraton Los Angeles International Airport has a variety of transport options which include airport transfers, shuttle services, and car rentals. Aviation/LAX Metro Station is 2.1 km away and Vermont/I-105 Metro Station is 8.9 km away. The nearest airport is Los Angeles International Airport (LAX), which is located 1.9 km away. This hotel provides an express check in and check out service, allowing you to avoid waiting in long queues when readying yourself for your commute home. Check-in is offered from 03:00 PM and check-out is until 12:00 PM. We found that the change of ownership Starwood to Marriott is a great move, Four Points Breakfast was over priced and the breakfast wasn't the best as i have been staying at this property for 10 years now, with the take over of Marriott the price of breakfast is much more affordable we found at $21.00 instead of $35.00 with Four Points and Marriott food was incredible! as Four Points was basic, Staff seam to be happier also. If you're looking for a property located near LAX and you don't want to pay $300 or more at one of the nicer properties, the Four Points might be a good option. The overstretched employees did their best when my room keys didn't work. Due to (I assume) understaffing it took quite a while for maintenance and security to meet me at the room, and after suggesting I had probably demagnetized the card (by holding it in my hand away from electronics and other cards), determined that the door lock itself was broken and I'd have to change rooms. It also took quite a while to make the several trips between the front desk and my room because the elevators were a bit wonky. They would randomly stop at floors where no one had pushed the button. I could go on, but you get the picture. You're probably going to get what you pay for. I'll stay there in the future if I need to, braced for the harsh reality I may face. The hotel is near airport, but very far from shopping area and restaurants. Self Parking is available at 15 USD per night. Staff is very kind and helpful. They even help me booking and printing NFL ticket. Coffee Shops at lobby is not big, and comfortable. Personally, I like this hotel and definitely come back. This hotel is very convenient for LAX airport, a very short shuttle ride freely available from outside each terminal. On arrival to staff handled check-in swiftly and efficiently and I will soon in my room after a long journey this was very welcome. The room was a good size with very comfortable bed, good shower/bath room, television and reliable internet via WiFi. I wanted to use this as a base to see the sights in LA which I can only say is difficult by public transport. It is essential to rent a car. They are car rental places all around the hotel so shop around for the best deal. The restaurant in hotel does very nice food and is reasonably priced, however there is a Denny's within 15 minutes walking distance which is also reasonably priced and does good food. A good hotel very convenient to the airport but difficult to get around if you don't have a car. We only stayed for a 6 hours between flights, but the staff was so helpful. My wife wasn't feeling well and they helped me get to the closest pharmacy. They also helped with making sure we had everything for my daughter who was exhausted after our long flight. Everyone we encountered was helpful and kind. The room was clean and comfortable. It had all the amenities we needed for such a short stay. The shuttle to and from the airport was prompt. The only complaint would be the elevators that can take a while. In transit after a long flight, and the hotel lived up to expectations. Easy and quick shuttle service to and from the airport. My flight arrived early in the morning and the hotel was very accommodating with an early check in. Rooms clean and well looked after. Would definitely stay here again. No free parking, shuttle from airport is too long, I end up waiting for more than half hour then switch to taking budget car rental shuttle since it is opposite the hotel and I'm renting budget. Thought I could check in, put my luggage then walk over to car rental but end up doing the other way round and there's only a 10min check in parking. My room was on the other wing which was a bummer since I can't drive to the other side to unload my luggage since that would mean having to pay for the parking just to unload my luggage. the hotel provide us free shuttle bus from the airport. But its took us about 1 hr standing at outdoor to wait for the shuttle bus. Hope can be improve the punctual on time, especially during winter. Burger king restaurant is just nearby about walk 5 minute to the shop. Great things about this hotel: - Free 24/7 airport shuttle - Very friendly & helpful staff - Has conference hall & swimming pool - Near Burger King - Near Los Angeles International Airport (LAX) - Clean rooms - Strong aircon - Good selection of TV channels - Coffee machine is fun & easy-to-use Excellent airport hotel. Highly recommended. The bar. Service. Comfortable bed. Good value, great bar with plenty of beers to try. Food was very good too. Comfortable bed. Our coffee machine did not work. I called the front desk and another was delivered within 3-4 minutes. I was impressed. Great service. This was our second stay there. Will return. the hotel is right opposite to budget (car rental) and provide shutter service to airport which is very convenient for early flight traveller. the staff at front desk is nice and helpful. the room is tidy and clean. yet, the wifi in the room is really slow that even checking email is problematic. also, the parking within the hotel is expensive. need to park on street. overall, it's good and i will recommend to my friends. This was on airport property so very convenient. My only problem was we had a very early flight, but seems like everyone else did too and they only had one shuttle at 5 am and we had just missed it (we were waiting for bell hop to come, could have been only one, for our luggage). Because of this, we had to wait 25 minutes for next shuttle, causing us to check in late for our flight. We did make the flight but not without a bit of a panic attack. The hotel was very nice. The staff lost the third party payment form from I sent in and made my pregnant wife wait in the lobby until 2 am when she could call me, in Beijing, to send in another form. They didn't apologize to her. I stayed in this hotel twice within 10 days. For the first time, the attendant offered me a $17 usd per day parking fee offer to me. For the second time, another attendant said that the parking fee is $32 usd per day and I need to pay by cash. As i mentioned the $17 offer last week, he said the offer was no longer available since 1st April. As I refused and had a look on the notice outside the car park, the charge to guest is $30 per day. Very close to the airport which was good. Just a little overpriced in my opinion. Unfortunately, one elevator was out of order, so we had to wait long time. Only the pillows that had some smell, but afterall was good.